Forget secondhand smoke–the Environmental Working Group thinks we should be worried about “secondhand scents” from perfumes containing hidden chemicals. A report from the EWG claims that best-selling fragrances like Chanel Coco, Britney Spears Curious, and Old Spice After Hours Body Spray contain a number of unlisted chemicals, many of which are associated with hormone disruption and allergic reactions. Fourteen secret chemicals not listed on labels due to a loophole in federal law that allows companies to claim fragrances as trade secrets. 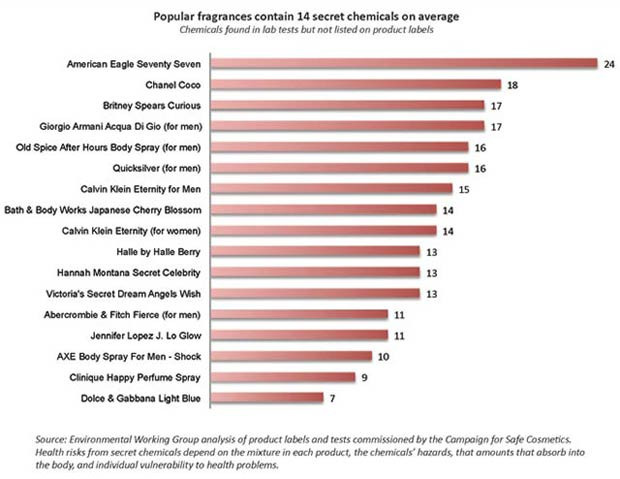 American Eagle Seventy Seven contained 24 hidden chemicals, the highest number of any product in the study. Ten sensitizing chemicals associated with allergic reactions such as asthma, wheezing, headaches, and contact dermatitis. Giorgio Armani Acqua Di Gio contained 19 different sensitizing chemicals, more than any other product in the study. Four hormone-disrupting chemicals linked to a range of health effects including sperm damage, thyroid disruption, and cancer. Halle by Halle Berry, Quicksilver and Jennifer Lopez J. Lo Glow each contained seven different chemicals with the potential to disrupt the hormone system. of nearly all Americans tested. The idea that fragrances can cause allergic reactions is nothing new, but the prospect of dealing with problems like sperm damage and cancer may put off any potential Old Spice Body Spray fans. Not all fragrances are created equal, of course. Dolce & Gabbana Light Blue contains only 7 hidden chemicals, making it practically innocuous compared to American Eagle 77, which contains a whopping 24 hidden chemicals. A recent report from the President’s Cancer Panel shows that it’s virtually impossible to avoid exposure to cancer-causing chemicals in our daily lives. But come on–we can all do without smelling like J. Lo.